• Special 2014 College Preview section features 36 pages of information about top teams, players in all college divisions. 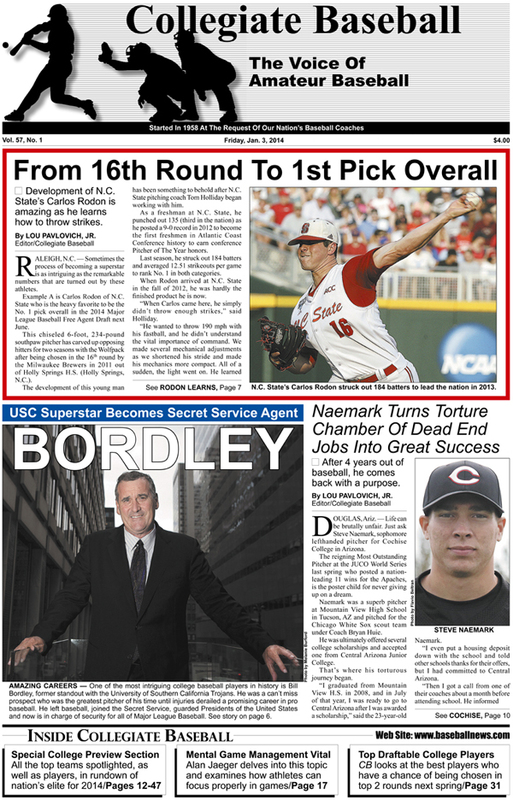 • In-depth feature story on the development of N.C. State pitcher Carlos Rodon and how he has gone from a 16th round pick in 2011 to the odds on favorite to be the first pick overall in the 2014 June Free Agent Draft. • Full page look at why Cal. St. Fullerton is ranked No. 1 in NCAA Division I. • Complete rundown on every team ranked in the Fabulous 40 pre-season poll, including top returnees, top newcomers, key losses and outlook. • In-depth look at all 31 NCAA Division I conferences, projected order of finish, last year’s RPI rating for each team, last year’s finish, projected pitcher and player of the year and rundown on top players for each team. • Louisville Slugger pre-season NCAA Division I All-American team complete with 3 teams made up of 80 elite players. • 2014 Draft Preview with a look at the top 60 players in college baseball projected to be first or second round picks in the June Free Agent Draft. • Rundown on pre-season All-Americans in NCAA Division II, players to watch and an in-depth look at the top 25 teams. • Top NCAA Division III players along with in-depth look at top 25 teams. • NAIA pre-season All-Americans, players to watch and an in-depth look at the top 16 teams. • Top junior college players across the USA, plus a close look at the top 10 NJCAA Division I teams and top five teams in NJCAA Divisions II and III. • California JC pre-season All-Americans, in addition to a look at the top 5 Southern California schools, top 5 Northern California teams and top 5 community colleges in the Northwest. • Special feature story on former USC superstar Bill Bordley who became a Secret Service Agent as he guarded presidents of the United States. • Special feature story on Cochise College LHP Steve Naemark who quit baseball, endured a torture chamber of dead end jobs for 4 years and now is one of the elite pitchers in junior college baseball. • Alan Jaeger delves into mental game management and how athletes can focus properly in games. • Oregon State’s Nate Yeskie named Collegiate Baseball’s Pitching Coach of The Year with an in-depth story of how he trains pitchers with his remarkable system. • Mississippi State’s Butch Thompson explains that the new flat seam ball may actually be a benefit to pitchers when it comes to command. • University of Washington builds stunning $15 million baseball stadium. • American Baseball Coaches Association feels that all coaches who work in youth baseball, including high school coaches, should be licensed and certified before being allowed to coach. • Pete Wilkinson and John Pinkman explain the importance of Myelin and why it is one of the hottest topics in the American Medical Association as a special discussion on this topic will take place at the ABCA Convention in Dallas Jan. 4 during the Pitching Hot Stove League session.